baby meets city: A Date Night Thanks to Chime: Let's Celebrate with a $50 credit! A Date Night Thanks to Chime: Let's Celebrate with a $50 credit! Husband and I don't get out much. I'm not PROUD of this fact, but it is a fact just the same. Busy schedules often get in the way, and to be honest, we haven't had a regular babysitter since our girls were really little. Friends used to babysit occasionally when we had just one kiddo, but throw an extra kid in the mix and I feel like we're overstepping our bounds. So naturally, I was very excited when Chime contacted me about helping spread the word about their babysitting service. 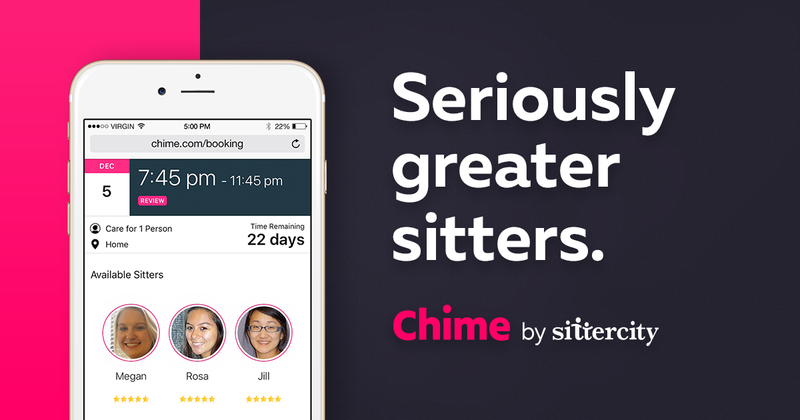 Launched by the creators of Sittercity, Chime sitters are hand-picked and go through a lengthy vetting process. This includes: an application, and in-person evaluation, enhanced background check, identity verification and social media screening. As a slightly-anxious-to-leave-my-kids-with-a-stranger mom, I really appreciate their thoroughness. The process of finding a babysitter (or "kid" sitter, as Millie prefers) is pretty simple, too. After creating an account on the site (or app), sitters are matched with you based on your zip code. When viewing a profile, you can discover each sitter's experience, reviews and ratings, video profiles and interviews prior to choosing your favorite. Sitters typically contact families beforehand (via phone or email) to get more information about the kid(s) and learn more about the family prior to showing up on the babysitting date. And here's the SUPER easy part -- no worrying about cash to pay the sitter at the end of the night! Payment is processed automatically via credit card through the app or website. Hourly fees vary per city with NYC being $17/hour (with each additional child $1 more per hour). With no subscription fees, Chime is completely commitment-free. Leana showed up to our door on Monday night, and she couldn't have been lovelier. She immediately began engaging with the girls, and when I walked out the door they were playing a game of Candy Land. I got the full recap the next morning, and the girls had so much fun! Meanwhile, their daddy and I attended a screening and Q&A with the actors and producers behind Showtime's The Affair, one of our favorite shows -- such a fun date night! To celebrate our kid-free evening, Chime is generously giving Baby Meets City readers a $50 credit to try their amazing "kid" sitters, which is good through July 31st, 2016. Please use CITY2016 to receive your $50 credit, and enjoy a date night (or even some "me" time) worry-free! Disclosure: I was compensated for this review with Chime. All opinions are my own. So good to know! After getting away with my husband for a weekend we promised each other that we will get a sitter on the regular. Will check this out and hopefully use this great credit! Thanks! I like this idea! We don't have a weekend sitter and mama wants a date night! I could use a night out! Looks like a great service!